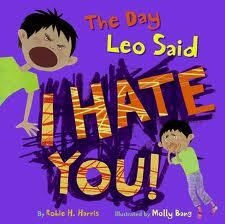 Last week I read The Day Leo Said I Hate you! written by Robie H. Harris and illustrated by Molly Bang (famous in my world for When Sophie gets Angry, Really, Really Angry.) We read it because some days there are lots of strong feelings and strong words flying around our classroom and so my belief is we need to embrace what’s going on and explore it. This book lets us explore how we feel when we get mad. What do we do with those frustrated feelings? What happens when our feelings explode and we say something that is hurtful? Can you take back words once they are spoken? Where do you go from the terrible words to get back to the care and connection that a relationship is made out of? Leo tells his Mom, “I hate you!” Then the two of them discuss how those words made them each feel. Did my class react? Oh my yes! One student pointed out, “__________ shouted those words at you last week, Ms. Gelson!” Very true. Now we had another way to look at that situation since we had been able to explore it through a well told story. Those words have big power, but there is also power in calming down, reconnecting and moving on. Talking about it lets it all be normal. One student burst into tears when our story ended. This story hit close to home and before she could continue with her day, she needed to write a letter to a family member to apologize for some strong words used that very morning. The book was a gift – it allowed her to give words to her sad feelings and move on with her day. I believe strongly in the healing power of books. When we talk about the stories, connect to the strong feelings, we learn about ourselves and our place in our world. Using powerful literature allows us to reach in and grab a hold of hidden feelings and shake them up. Doing that in a caring, calm classroom builds community along with strong emotional learners. Books have the ability to connect us through stories and our conversations allow us to strengthen those connections even further. This entry was posted in Uncategorized and tagged favourite illustrators, fiction, great read alouds, making connections, Molly Bang, picture books, Robie H. Harris by carriegelson. Bookmark the permalink.